This article assesses the integrity, in heritage terms, of the legal regime which regulates local “heritage conservation areas” (HCAs) in NSW. After establishing the historical context necessary to properly understand the HCA regime, the process by which local councils identify, regulate and manage their HCAs – to conserve places of local “heritage significance” – is examined. From this foundation, this article grapples with arguably the most controversial pillar of the HCA regime: the effective prohibition on demolishing “contributory buildings” in HCAs (except in exceptional circumstances). The central argument of this article is that the theoretical and philosophical justification underpinning the established legal position regarding “contributory buildings” is problematic and unconvincing. This conclusion is predicated on an original and close examination of both the HCA regime as it applies to one particular local council, Mosman Municipal Council, and pertinent HCA case law. Ultimately, it is warned that certain aspects of the current HCA regime threaten to undermine the integrity of places of local “heritage significance” and, therefore, risk eroding public and State government support for protecting these vital heritage places. Seawalls are becoming an increasingly popular form of defence against coastal hazards, with governments and landholders both in Australia and globally incorporating seawalls into coastal management strategies. A seawall provides a perception of safety, encouraging continued or increased development and occupation in hazardous areas. However, the effectiveness of a seawall is dependent on adequate design, construction and maintenance, and failure to consider these issues at the development approval stage may expose governments to major legal risks. This is in addition to the major legal risks already posed to governments from legacy seawalls, and illegally constructed structures. The purpose of this article is to analyse the legal risks to government posed by three types of seawall developments: new developments, legacy approved developments, and illegally constructed developments. It will also explore the options available for managing the legal risks in each context. Finally, it will encourage governments to consider other courses of action for addressing vulnerability to coastal hazards, given the inherently risky nature of modifying the coastline. 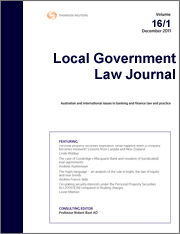 For the PDF version of the table of contents, click here: LGLJ Vol 21 No 1 Contents.